^ "Scientists reveal what St Valentine really looked like". Mail Online. Retrieved February 28, 2018. ^ a b Kithcart, David (September 25, 2013). 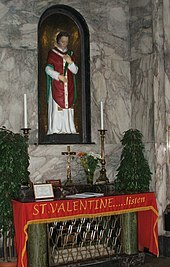 "St. Valentine, the Real Story". CBN. In the year 269 AD, Valentine was sentenced to a three-part execution of a beating, stoning, and finally decapitation all because of his stand for Christian marriage. The story goes that the last words he wrote were in a note to Asterius' daughter. He inspired today's romantic missives by signing it, "from your Valentine."